Optional fighting styles are available to the fighter. The barbarian class is added, based on the version published in White Dwarf magazine in 1977. The thief has more martial ability than in straight S&W. The magic-user and cleric are gone, replaced by the magician, who can cast both magic-user and cleric spells but faces moral choices and mechanical risks when choosing between white, gray, and black magic. Magicians can't turn undead. Ability bonuses range up to +3 instead of +1. All PCs are human; there are no elves, dwarves, or halflings (or vadhagh), at least not as PCs. Simple skill rules and sanity rules are added. Both work off of saving throws. A character's starting sanity points equal his Wisdom score. Lost sanity can be recovered, but if it ever drops to 0, further losses reduce Wisdom permanently. The game is more generous than S&W with starting hit points, and with a bit of luck, a character can keep fighting when all his hps are gone. Further damage comes off Constitution, and the character must make a saving throw to remain conscious every time he takes Con damage this way. Don't let that list bullet point trick you into thinking that C&T is in any way less punishing than S&W. Despite letting 1st-level characters start with maximum hit points for their class and letting everyone recover 100% of their hit points with a good night's sleep, C&T is about as punishing as standard S&W in this regard. How can that be? Because in standard D&D, healing potions restore hit points; in Crypts & Things, healing spells and potions only restore Constitution points. While you're down Con points, you have a -2 penalty on all your attacks and saving throws. In a standard OD&D/S&W game, if you're at -1 hit points--assuming you're not dead at that point--you can receive a cure light wounds spell, regain 4 hit points, and be almost as good as new. In C&T, "-1 hit point" means you're at 0 hps and -1 Con. Yes, you can keep fighting (at -2 to attack), provided you make your saving throw every time you take damage (at -2 on the save). Drinking a healing potion while at -1 Con gets you back to full Con but restores no hit points, so the next time you get hit, you're right back in the same boat. The standard S&W character who gets back on his feet with 4 hps might get lucky the next time something hits him and take only 1-3 points of damage. In C&T, there's no buffer; healing gets you to 0 hit points, and any hit is going to drop you back into Con damage territory. This is a different approach to the problem of giving low-level heroes a chance to survive, but it does not make low-level characters significantly more robust than just saying they die at, say, -5 hps. You need to get lucky on saving throws to keep battling on heroically after all your hit points have bled out onto the cold stone floor, especially at low to mid levels. When your hit points are gone, you're probably going to face-plant into the dust like any other dumb sack of spuds. One nice touch in all this is that characters can regain hit points (not Con points) by taking a slug of "strong drink" (Nemedian ale, Stygian absinthe, or whatever else passes for stiff liquor in your campaign). No magic is required; you regain 1d4 hps, once per day. The four character classes are different enough from the S&W standards that they deserve close reading. The barbarian is unique, and the others aren't just your older brother's fighter, thief, and magic-user in savage face paint. The fighter is the most familiar of the four. He gets the best attack bonuses, the most hit points, the juiciest armor and weapon choices, and six different attack styles to learn. For this, he pays more XP than either the barbarian or thief to advance, and he has less attractive saving throws than all of the other three. Because saving throws triple up as skill rolls and as stay-on-your-feet rolls when damage is chipping away your Con points, those weak saves are a big deal. I'd probably give fighters a +2 bonus on saves to remain conscious at 0 hit points. Otherwise, thieves, barbarians, and even magicians have better odds of continuing the fight under desperate conditions than the characters who are nominally the toughest fighters in the game. The fighter's attack styles allow players to zero in on how their character goes about the job of killing things and to get some bonuses for being a specialist. In d20 terms, they're feats. 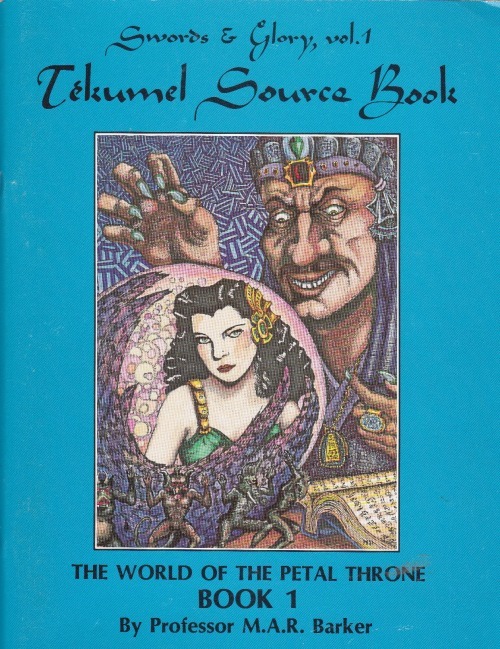 To some OSR fans, feats symbolize everything that's wrong with post-d20 D&D, so their inclusion in an old-school book like C&T is slightly surprising. Unless you're a reactionary, they're not a bad thing. Despite a few new-school touches, the feeling of C&T as a whole is overwhelmingly old-school. Thieves, too, are largely familiar. Instead of listing their skills on a table with ascending probabilities by level, their skills are resolved as saving throws with a class bonus. True to Swords & Wizardry, there is no standard rule describing when a character can add a high stat bonus to a saving throw; that's up to the DM. Because S&W uses only one saving throw, however, a thief has roughly identical odds for success no matter what skill he's using. It doesn't matter whether you're climbing a wall, picking a pocket, or hiding in shadows, your chance to succeed is your level-based saving throw, plus 3 because you're a thief, plus whatever other modifiers the DM assigns. It's simple and direct, but the high chance for failure means few will be foolish enough to try scaling the 100-foot-tall Tower of the Spider Mogul. Barbarians are similar to thieves. They have identical attack bonuses, XP requirements, and hit dice, though the barbarian's emphasis on Constitution means they'll probably have more hit points than the average thief. Both get the same bonus to climb walls, perception, and stealth. Barbarians have better armor and weapon choices and get a +1 bonus on armor class instead of the thief's +2; the thief's emphasis on Dexterity means he's likely to come out ahead on AC. Barbarians are immune to fear effects (they go berserk when more civilized folk run away), resist poison and disease (+3 on saving throws), can sense danger and follow tracks, and get a big bonus on first-round attacks and damage when they win initiative. The magician class is, as far as I know, unique to Crypts & Things. Superficially, magicians look a lot like OD&D/S&W magic-users. The workings of magic, however, are entirely different in C&T. Spells are divided into white (beneficial), gray (manipulative), and black (destructive and "contrary to nature") schools. White magic is cast normally. Casting a gray spell costs the wizard hit points equal to twice the spell's level, the same as if he'd been struck with an arrow. Merely to memorize a black magic spell, the magician must either sacrifice a sentient creature or lose Constitution points equal to twice the spell's level. When a black magic spell is cast, he must make a saving throw or lose Sanity points equal to the spell's level. This begs a puzzling question that isn't overtly answered in the rulebook: When a magician loses Con for memorizing a black magic spell, must he make a saving throw to avoid falling unconscious for eight hours? Does he suffer the -2 penalty on attack rolls and saving throws for having reduced Con? The rules don't say otherwise, so I assume the answer to both is yes, but this being a Swords & Wizardry variant, every DM is free to draw his or her own conclusion. I foresee black-magic users spending weeks prepping for an adventure: memorize fireball, then lay up six days recuperating from the effort before memorizing snake charm and spending another six days in bed (attended by a bevy of undead slaves and serpentman healers, no doubt). Note that none of these changes make magicians easier to play than standard magic-users; in fact, they all work against magicians. The most powerful spells injure the caster one way or another. Two things are offered to mitigate that blow. First, magicians are allowed to wear leather armor. That's a nice, if small, concession. Second, magicians with Intelligence 15 or higher "earn" an extra 1st-level spell. The word "earn" is unfortunate in this context. It's not clear whether it means smart characters start with an extra 1st-level spell in their spellbooks, or they can cast one extra 1st-level spell per day. Option 1 is OK but doesn't help much in the real adventuring world, since 1st- and 2nd-level characters tend to stick to just one or two spell choices anyway. The latter is a major boost that would go a long way toward compensating magicians for the other handicaps. Such worldbuilding-by-rules enforces a different style of D&D onto a Crypts & Things campaign. I support that approach. Even "generic" D&D forces assumptions onto the setting. C&T's assumptions seem fairly carefully chosen to steer play into a hard-edged, weird swords & sorcery style. If you dig that sort of thing, then this is a solid approach. Combat is exactly what you expect. There are no surprises in this chapter for players of Swords & Wizardry or OD&D, except for the hit points + Constitution rules mentioned earlier. Other than being divided into white, gray, and black magic and stopping at level 6, the spell list is similar to that in the S&W Core. A few new, Zarth-only spells have been added, such as call the kindly ones and cauldron of blood, but most will be familiar. Raise dead and reincarnation, however, are conspicuously absent. If your character dies at any level of play and no powerful, otherworldly entity owes you a favor, it's time to grab 3d6 and a fresh character sheet. The monsters are plentiful, and while many of them are things we've seen in every other retroclone, enough of them are unique and tailored to C&T's weird, pulpy setting to hold your interest. 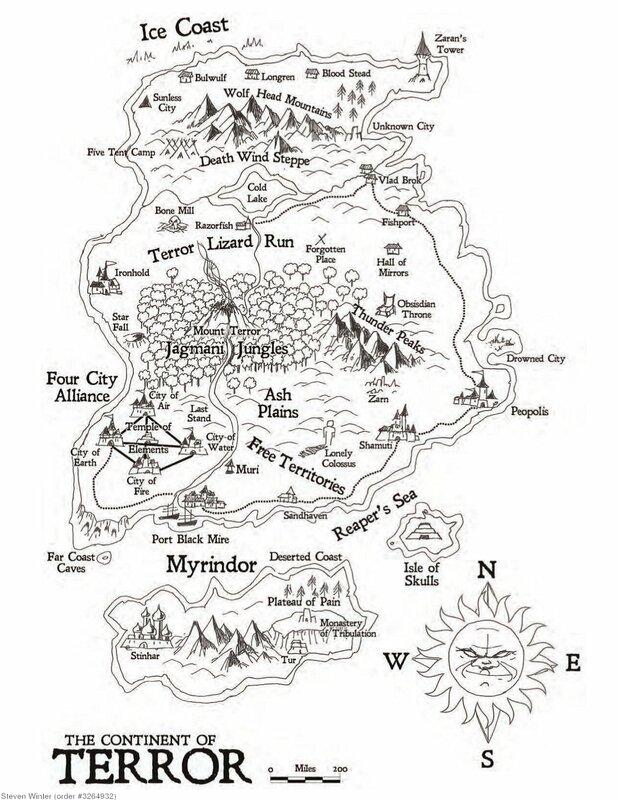 The Continent of Terror is the only part of Zarth that’s mapped and described. The descriptions are brief—just enough to stir a few adventure ideas. That’s by design, as the author states that he wants to provide only an outline and let the DM craft his own version of the world. 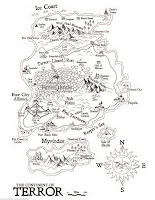 The Continent of Terror has more in common with Leiber's Newhon than Howard's Hyborian Age in that there are no countries to speak of, just regions, cities, and mysterious locales. A central idea behind Zarth is that it’s just one of many worlds. All the other worlds are inhabited or overrun by demons or Others, a catch-all term for any monstrous entity. Zarth is isolated and somewhat protected by the Shroud, “a dark and unfathomable magical netherworld that separates our Reality from the Other Worlds.” Unfortunately, foolish ancient sorcerers opened a gateway to these other worlds and left it open. The so-called Locust Star “blazes in unholy glory in the sky above Mount Terror.” Demons come through the Locust Star to plague Zarth—and thus, adventures are born. Magicians are forced to risk contact with the Shroud when they cast certain types of spells. It probably goes without saying, but dipping your toe into the Shroud is generally dangerous to both body and soul; you attract the attention of Others while you're there. This is a nice touch. Far and away C&T’s biggest failing--the only one I'm even going to mention--is that the book is lousy with typos. * It pushes the boundary of what’s tolerable even for an amateur publication. I was so exasperated by the errors on my first reading of the PDF that I almost chucked the whole thing as a shambles. Given my long background in editing, maybe I'm more sensitive to editorial flaws than most. If you’re like me, you’ll gnaw on your fingers while reading C&T. But different people place different value on quality editing. Maybe it won't bother you at all. Fortunately, I didn't spot many errors that caused any real confusion; the tables and the substance of the rules were always clear despite the typos. 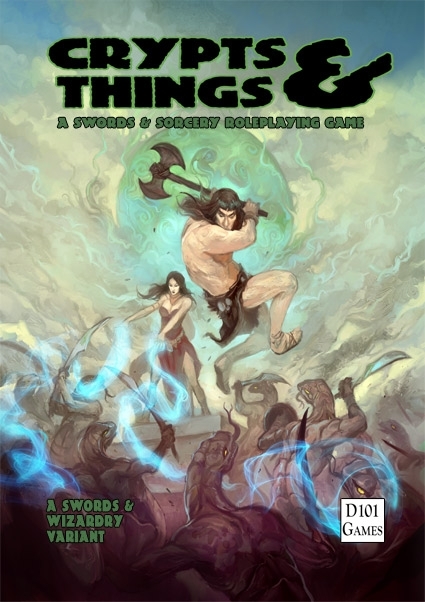 If you can swallow the rampant typos, Crypts & Things offers a unique twist on OD&D/S&W play. The setting-specific classes and magic rules make Crypts & Things a different experience from the Swords & Wizardry core, and it's one that I'd jump at the chance to play. * It's been brought to my attention, since posting this review, that Crypts & Things is a British production, and many of what I consider misspellings are actually correct British spellings. On looking through the book, I see that explains many--but far from all--of the spelling issues. In light of that, I'm stepping back from "lousy with typos" to merely "laced with typos." I do have a copy of AS&SH, since it was one of the Three Castles Award nominees this year. I'd like to post a review of it sometime before summer is over. The ultra-condensed version is that while AS&SH is an admirable piece of work, a lot of other OSR titles rank above it on my "I'd play that" list. Laying out the reasons for that will have to wait until I can address them in the detail they deserve. Yeah, C&T is nice D&D/S&W variant, nice and heavy on the Sword & Sorcery and "the Weird" themes. I really like the vibe it has has. But as you alluded to, it REALLY could stand a good edit, even when taking British spelling into account.